Huntington Harbour Village is a 55+ community located in Huntington Beach, California. With 130 homes on a 15-acre park, Huntington Harbour Village is a beautiful community where staying physically fit and socially active are easy, thanks to a set of terrific amenities and living in the highly desirable city of Huntington Beach. When it's time to relax at home, residents are greeted with gourmet kitchens and private patios in low-maintenance homes, perfect for entertaining or getting swept up in a new book. 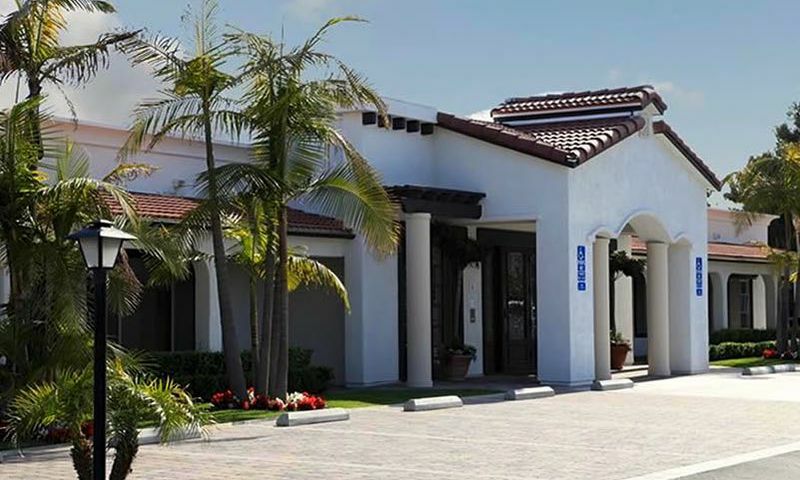 At the center of Huntington Harbour Village is the well-equipped clubhouse. Homeowners can stay fit with the exercise room before relaxing their muscles in the sauna. Gather with friends around the billiards tables, play a game in the card room, or make a great meal everyone can enjoy in the catering kitchen. With an unmatched year-round climate, Huntington Harbour Village provides several opportunities for enjoying the outdoors. A pool, spa, and patio are where residents gather to swim some laps or relax poolside. A barbecue area and fire pit are available for community gatherings. Huntington Harbour Village has a putting green for working on your short game and a community garden for getting some fresh air. An R.V. parking lot means that you can say goodbye to expensive parking fees. Huntington Harbour Village was developed between 1996 and 2006 and now has 130 single-family homes. Available on a resale-only basis, these homes range in size from 1,300 to 1,800 square feet and offer two or three bedrooms, one or two bathrooms, and a carport for up to three cars. Some homes come with highly desirable features like vaulted ceilings, private patios, walk-in closets, and gourmet kitchens. Huntington Harbour Village combines the best of 55+ community living in a picturesque neighborhood. The homeowners' association fee covers on-site management and maintenance, security checks, as well as a trash and recycling program, giving residents more time to pursue their own interests while providing a lock-and-leave lifestyle. Residents can also enjoy the company of neighbors with community barbecues, card games, billiards, or challenging each other on the putting green. Huntington Harbour Village is located in Huntington Beach, California. The community is located just two miles from Highway 1 and just four miles from Interstate 405, allowing residents convenient access to all that the region has to offer. For everyday needs, Huntington Harbour Village is a short drive from Westminster Mall and is just down the street from an Albertsons, restaurants, and dry cleaners. The Huntington Harbour Medical Center is less than a mile away. For farther travel, John Wayne Airport is about a half hour away. Huntington Harbour Village is in the highly rated city of Huntington Beach. Outdoor enthusiasts will be delighted by the surrounding wetlands, the miles of beaches, and the neighboring Seal Beach National Wildlife Refuge. Golf lovers will find plenty of courses nearby, including the Old Ranch Golf Course, the Destroyer Course, and the Meadowlark Golf Club. Those seeking a big-city vibe will find that downtown Huntington Beach has the shops, restaurants, and bars to satisfy. Huntington Harbour Village provides a picturesque 55+ neighborhood in the perfect location in Orange County, California. There are plenty of activities available in Huntington Harbour Village. Here is a sample of some of the clubs, activities and classes offered here. Huntington Harbour Village was developed between 1996 and 2006 and now has 130 single-family homes. Available on a resale-only basis, these homes range in size from 1,300 to 1,800 square feet and offer two or three bedrooms, one or two bathrooms, and a carport for up to three cars. Some homes come with highly desirable features like vaulted ceilings, private patios, walk-in closets, and gourmet kitchens. Please Note: Floor plans are not available at this time. 55places.com is not affiliated with the developer(s) or homeowners association of Huntington Harbour Village. The information you submit is distributed to a 55places.com Partner Agent, who is a licensed real estate agent. The information regarding Huntington Harbour Village has not been verified or approved by the developer or homeowners association. Please verify all information prior to purchasing. 55places.com is not responsible for any errors regarding the information displayed on this website.